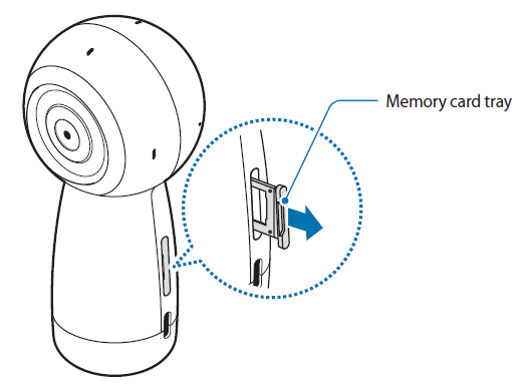 Samsung Gear 360 (2017): How to install the memory card? Step 1. Pull out the memory card tray gently from the memory card tray slot. NOTE: Be careful not to damage your fingernails when you remove the memory card tray. Step 2. Gently press the memory card into the memory card tray with the gold-colored contacts properly aligned with the Gear 360's contacts. Step 3. Insert the memory card tray back into the memory card tray slot. [Gear 360] How to connect with mobile device using wifi-direct? Samsung Gear 360 (2017): What is the specifications of the memory card used? 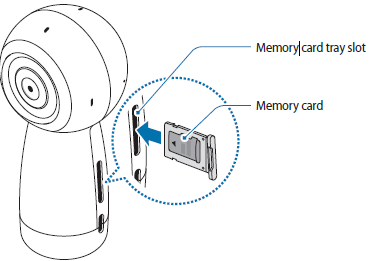 Samsung Gear 360 (2017): How do I remove the memory card?